Inside: Philippians 2:14-15 is the D verse of the ABC Bible Verses. 26 Bible Verses to help your child learn one bible verse for each letter of the alphabet. 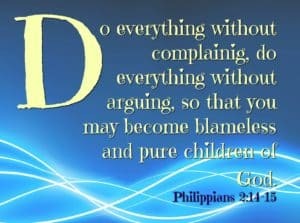 Do everything without complaining. 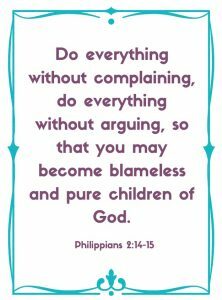 Do everything without arguing so that you may become blameless and pure children of God. This verse doesn’t need any explanation and is one we need whether we are 9 or 99! Once you check out the tune below, it’s one you’ll never get out of your head either! I suggest printing out the verse each week and keeping it nearby. We like to hang these by the bed where we are learning the verse and replace them each week. You can find all the verses in the resource library available for free. You can choose the full-color option or a printer-friendly option – both in the resource library. Everyone learns faster when the words are put into a tune. And Bible verses are no exception! This one is by far the most catchy tune and it has a great video as well. It may seem a little cheesy but my kids really liked it. It is another song by Steve Green and even though the verse is a little longer the tune is one you won’t easily forget. Click below to watch the video and good luck only watching it once a night! My kids wanted to watch it multiple times a night. 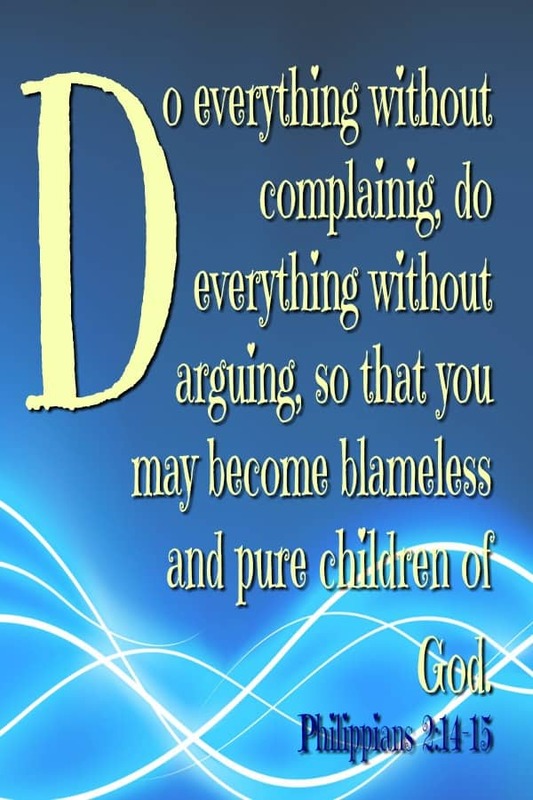 To put the verse into action, after watching the video, talk with your child about what happened today where they gave into complaining or maybe stifled their complaining. Repeat this each night and see if they (and you) improve by adding accountability and reflection to your evening. A printable of each ABC verse. A reflection page for your child to write the verse out and say what it means to them. A word search of the ABC verse. A page for your child to draw out the verse and write what books of the Bible this verse can be found in. 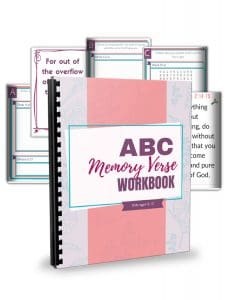 A page to cut out each word of the verse, then your child can try to put the verse together. Catch the whole series HERE! Complete with printables, songs, and full index!